The second to last paragraph in this well argued and balanced piece states: “Iran could do more to bring down regional anxieties about its missiles – notably by erasing the provocative slogans ‘Death to Israel’ written on them. Iran, blood curdling threatened by the US and Israel, is not alone on writing intemperate slogans on missiles. The Chairman of the Joint Chief of Staff, General Colin Powell also signed a bomb: “To Saddam, You didn’t move it, now you’ll lose it. Colin Powell.” (NY Times, 11th February 1991.) Powell was referring the Iraqi army sent to Kuwait in after Kuwait had refused to compensate for eight years of oil theft from Iraq’s Rumaila oil field. When the Ameriyah civilian air raid Shelter was bombed three days after the bomb signing, on the anniversary of the bombing of Dresden and St Valentine’s day, during the holy Muslim observance of Ramadan incinerating all those inside, there was panic in US military circles that the bombs might have had Cheney or Powell’s names on (literally) we are told they did not. Who knows. Pictures of US airmen’s messages on the bombs they drop around the planet, abound. During the 2006 Israeli assault on Lebanon, Israeli parents and children signed tanks shells destined to decimate the population of Lebanon, where a quarter of the population is 0-14 years and the average age is 28. Pictures show this “ceremony” being repeated during the attacks on Gaza in 2008-9 (Operation Cast Lead) and in 2014 (Operation Protective Edge.) Gaza of course, has no army, no navy, no air force, is embargoed, imprisoned and totally vulnerable. Emboldened by Donald Trump’s apocalyptic threats against Iran now, nuclear armed Israel has, equaled and followed them. Iran has not attacked another country since the Shah’s assault on Basra, Iraq in 1798. Just to put Iran’s missile painting in context. One of the main grievances of President Trump and other critics of the 2015 Iran nuclear deal (Joint Comprehensive Plan of Action or JCPOA) has been its silence on ballistic missiles. In connection with his recent refusal to certify that sanctions relief under the JCPOA is proportionate to Iran’s respective commitments, Trump invited Congress to take tough measures against Iran’s “dangerous ballistic missile activities.” In particular, he stressed the need to “prevent Iran from developing… an intercontinental ballistic missile” [ICBM]. The desire to counter this threat is not only limited to those who are against the deal. Recently, Congressman Eliot Engel—a New York Democrat who opposed Trump’s decertification decision—said that the deal’s exclusive focus on the nuclear issue “frustrated me to no end.” Engel and others are now answering the president’s call to address the deal’s “flaws” with new sanctions legislation targeting Iran’s missile program. Before rushing to impose more sanctions, members of Congress should check their assumptions about Iran’s missiles and consider whether new punitive measures are really in line with the U.S. interest in maintaining the JCPOA. After the nuclear agreement was reached in July 2015, the UN Security Council issued resolution 2231 endorsing the JCPOA. The resolution calls on Iran “not to undertake any activity related to ballistic missiles designed to be capable of delivering nuclear weapons” until 2023. Iran and the U.S. have different interpretations of this resolution. Although the missile issue was not part of the nuclear deal, the U.S. expected that Iran would have voluntarily suspended missile testing for eight years. In reality, however, Iran has no ICBM program. Despite repeated U.S. estimates over the years that Tehran could soon develop ICBMs–and the persistent assumption that it would test one before 2015–Iran’s missile arsenal continues to be limited to short- and medium range. Iranian officials have also repeatedly said that the country has no need for longer-range missiles. This position was again confirmed last Tuesday, when the head of the Islamic Revolutionary Guard Corps (IRGC) General Mohammed Ali Jafari said that the Supreme Leader had restricted the missiles’ range to 2,000 km. The policy has apparently been in place since 2013, but it only caught global media attention with Jafari’s above statement. The stated policy is in line with Iran’s pattern of missile testing, which has long been focused on enhancing missile accuracy instead of range. This suggests that the missiles are meant to be conventional, rather than nuclear. Accuracy is not needed for indiscriminate nuclear weapons, but it increases the missiles’ military utility and credibility as a conventional deterrent. In addition to increasing accuracy, Iran is seeking to improve its missiles’ survivability against the anti-ballistic missile systems in the region. As for Iran’s satellite program, it is not a smoking gun on ICBM intentions. Although expertise on Space-Launch Vehicles (SLVs) can contribute to long-range missile development, there are crucial differencesbetween the two technologies—which is why no country has ever simply converted an SLV to an ICBM. Even if Iran would do this, it would still need to test the missile several times, which would not go unnoticed. Iran views its missiles as a non-negotiable means of self-defense and as a counter to the Western-supplied military capabilities of its regional rivals. The military significance of missiles is highlighted by the relative weakness of Iran’s conventional forces. Unlike most states in the region, Iran is not part of any major security alliance. Apart from missiles, it has not procured any major weapon systems for decades. Iran’s missile program originally began during the era of late Shah, in cooperation with Israel under Project Flower. Given its air force’s superiority, however, the Shah never seriously pursued a ballistic missile capability. Only after the Islamic Revolution and the bloody war with Iraq (1980-1988) did Tehran decide to vigorously invest in ballistic missiles. Vulnerability to Saddam Hussein’s attacks—including daily air and missile raids against major cities—highlighted the need for an effective deterrent. With its once great air force in ruins, and having been largely excluded from the international arms market, Iran turned to North Korea in the 1980s and 1990s to buy ballistic missile technology. Since then, Iran has become increasingly self-reliant in missile production. The deterrent function of Iran’s missiles gained further importance during the nuclear crisis, with threats of military action against Iranian nuclear facilities. Iran vowed to retaliate against a preventive strike by launching its missiles at Israeli cities and US bases throughout the region. Apart from being a deterrent force, Iran’s missile program symbolizes the key tenets of the Islamic Revolution: independence (Esteqlal) and self-sufficiency (Khod- Kafaayi). It is therefore no coincidence that the missile program is operated by the Iranian Revolutionary Guards Corps (IRGC), whose primary task is to defend the Islamic Revolution’s values. The IRGC and the Iranian armed forces regularly showcase the missiles in military exercises and parades, the most important of which is on September 22—the anniversary of the beginning of the Iran-Iraq war. The name of Iran’s new missile, which was exhibited in the latest such parade, is also highly symbolic. The missile is named after Khorramshahr, a city that Iran recaptured from Iraq during the war, symbolizing resistance and victory over the aggressor. The missile program also enjoys domestic legitimacy. 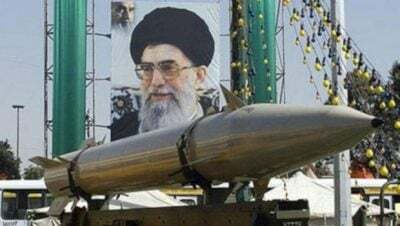 A survey conducted by the University of Maryland in July 2017 indicated that 63 percent of Iranians regard halting the missile program as unacceptable. The survey was conducted in the aftermath of the June 2017 Islamic State (ISIS or IS) attacks in Tehran, to which Iran responded by launching a salvo of ballistic missiles against IS bases in Syria. The strikes served the purpose of power projection, but they were also a retribution for the shock caused by terrorist attacks on Iranian soil. Given the central role of missiles in Iran’s national security strategy, it is unrealistic to expect the country to give up efforts to further develop its missiles. While doing nothing to change Iran’s missile policy, new punitive measures risk jeopardizing the JCPOA. As far as Iran is concerned, the actions of the Trump administration have already violated the U.S. commitment to refrain from policies harming legitimate trade with Iran. For now, Tehran seems to have decided to stick to its own commitments as long as the United States does not re-impose the sanctions lifted under the JCPOA. In its recent report on JCPOA implementation, Iran’s parliament mandated the government to take reciprocal actions (i.e. suspend voluntary cooperation) if the sanctions are re-imposed. A potential decision by Congress to make U.S. commitments under the JCPOA conditional on Iran’s missile policy would therefore likely mean an end to the nuclear deal. Even if the US measures do not directly impact nuclear-related sanctions, impeding international trade with Iran would further enforce the perception that sanctions relief is not being implemented. Each hostile American action also plays into the hands of Iranian hardliners, whose attacks against the moderate Rouhani government have steadily increased during the past year. The situation bears an ominous resemblance to the second term of President Mohammad Khatami. Khatami’s overtures to the United States became the target of domestic criticism after President Bush’s “axis of evil” rhetoric, helping hard-liner Mahmoud Ahmadinejad win the 2005 presidential election. A tilt in the domestic balance in favor of hardliners would negatively impact not only domestic politics and human rights in Iran. It could also lead to a reconsideration of the JCPOA, as well as a more confrontational nuclear policy after the deal expires. Those advocates of new sanctions who are driven by concerns about Iran’s ICBM pursuit should breathe a sigh a relief, as there is no such threat in sight. As for Iran’s arsenal of conventional short- and medium-range missiles, it does not constitute an imminent threat either to the United States or its allies—unless they are planning to attack Iran, to which Tehran would likely respond with missiles. The Supreme Leader’s decision to restrict the range of its missiles can be seen as a confidence-building measure. Iran could do more to bring down regional anxieties about its missiles—notably by erasing the provocative slogans “Death to Israel” written on them. However, the Rouhani administration has little or no control over the IRGC, which only responds to Ayatollah Khamenei. In a rare occasion during the presidential debates of 2017, Rouhani used the opportunity to slam the IRGC for the slogans on the missiles. Nevertheless, it should not be a surprise that President Trump’s decertification decision has united the IRGC and the administration, which have avoided further confrontation with one another. One should therefore be careful not to fall into the trap set by those whose alleged concerns mask cynical efforts to kill the nuclear deal, the collapse of which would only increase fears associated with Iran’s missiles. The best way to change Iran’s missile policy is by mitigating its respective security concerns, not by exacerbating them with measures that risk recreating the nuclear crisis.